Out of nowhere, you’re brought to your knees again by a cruel turn in life. You’re emotionally winded and spent. You’re in pain and confused. You realize finally that something has to change; something needs to be let go of. And now you’re listening loud and clear. Change is uncomfortable, good or bad. Letting go is always a change. Something is being removed so that something else can take its place. The past is more familiar and comforting to you than not knowing what will happen when you let go. When you let go of something you want very much, the change is even more dramatic. Letting go is changing how you see yourself. The deeper the desire was­­ for a job, girlfriend/boyfriend, vacation, you name it­­, the more it became a part of you. The bigger a part of you it was, the more incomplete you will “feel” when you let go of it. Perhaps the words we use are deceiving; ‘letting go’ seems to mean that your desire is something you were simply holding, but the pain you feel tells you that in some big way it is a part of you, and that you are actually “cutting out.” I think the difference between these words is important. As Christians, our desires are meant to pull us closer to God- to want to please Him and be more like Him. 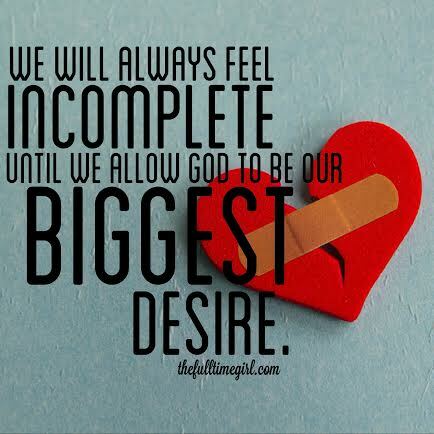 We will always feel incomplete in one way or another until we allow God to be our biggest desire. He needs to be the desire that shapes all of our other desires. He needs to be the biggest part of who we are. He alone knows how to complete us. 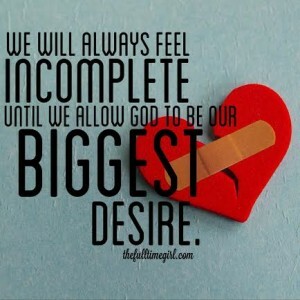 Life provides us with many things that our natural, fallen selves crave to complete us instead of Him. Many things promise to fill that hole, but they are just shadows and lies that will always fall short unless they come from God. There are sharing buttons below – do your thing!